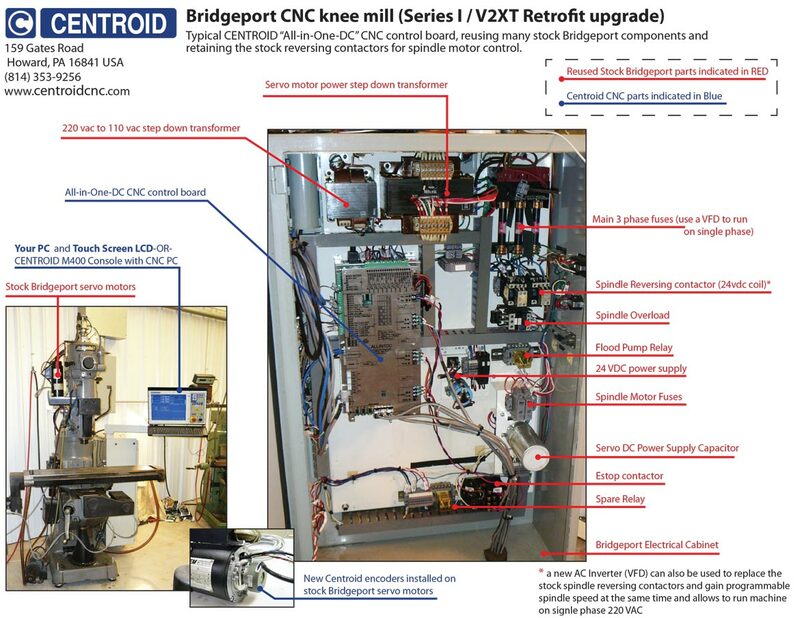 CNC Controller for Bridgeport V2XT DX-32 CNC retrofit controls for Knee mills. 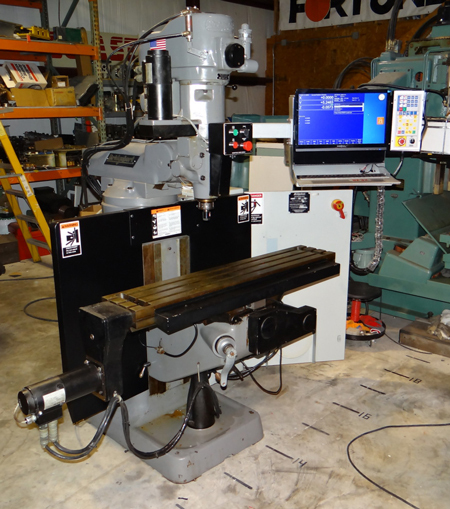 "After"..M39 CNC control upgrade and ready to make parts! In addition to all the great CNC features that you get with the CENTROID, After the retrofit, the Bridgeport V2XT / DX-32 will be faster, more accurate, quieter and is easier to program and operate.. 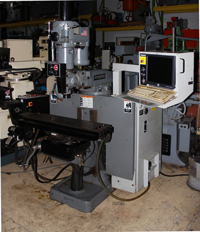 This machine was upgraded in 14 hrs reusing the existing original DC Servos motors (with an encoder upgrade, click here for more information). With a CENTROID retrofit upgrade kit, you will be up and cutting parts, making money in a matter of days. This machine used the Centroid Bridgeport M39 DIY CNC control upgrade package that utilizes the Centroid Allin1DC CNC control board. The Centroid Allin1DC CNC control board can be seen in the lower left of the "After" image above along with the new CNCPC in the lower right and a new VFD for programmable spindle speed control of the spindle motor. 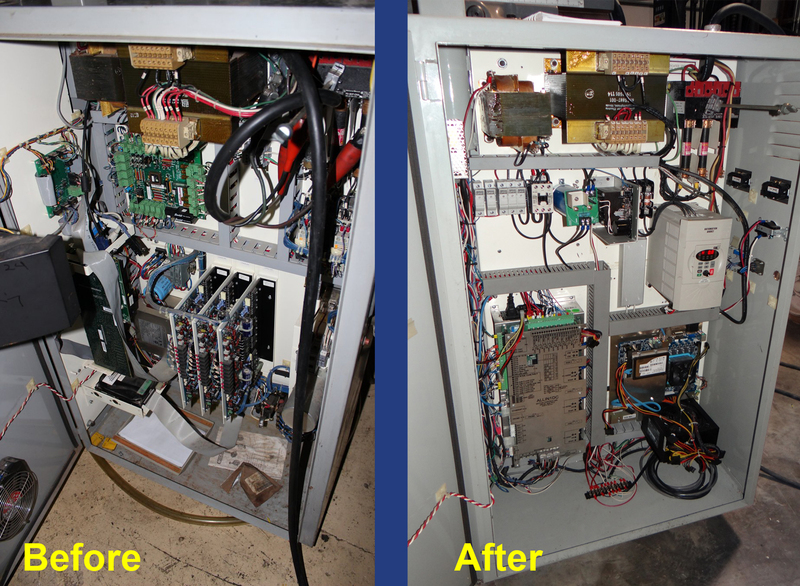 The original Disconnect and Transformers were reused, while a new Centroid Cap Board Combo replaced the old Bridge rectifier and a few new circuit breakers were used to replace the old fuse blocks. 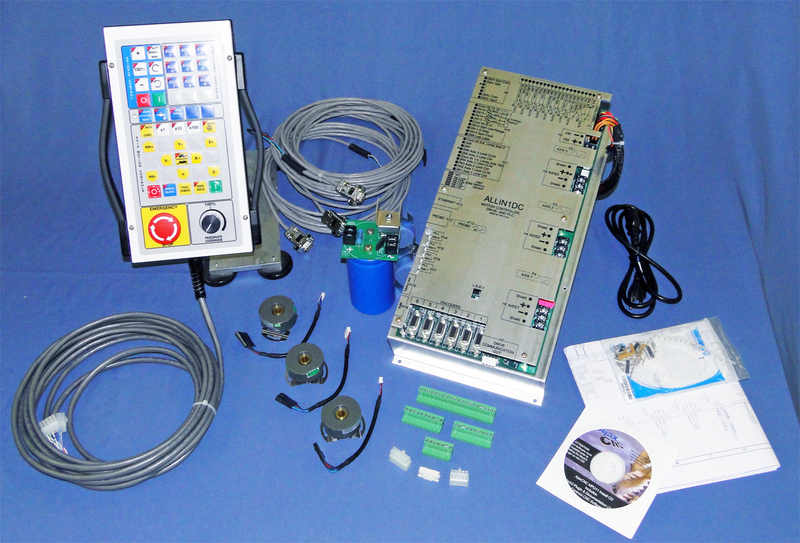 The Allin1DC has 9 relay outputs built into the CNC control board and they were used to control the existing Lube Pump, Mister and Work light which eliminated the old relays. The stock servo motors are retained and even the stock servo cables can be reused (if they are in good condition). The stock SEM DC servo motors are upgraded with a modern encoder to be compatible with the Allin1DC CNC control board. the Stock operators control console is modified and reused. A touch screen LCD is placed where the old CRT would go and the mounting bracket for the Centroid CNC operators pendant is bolted to the stock DX-32 console. This customer also chose to upgrade the operator control buttons on the Head of the machine (which are duplicated on the Pendant as well). Centroid Bolt-on replacement DC servo motors are available for the case where an original motor is missing or damaged. Now this machine is more capable than ever with many standard CNC features that go way above and beyond the original DX-32 capabilities. The Centroid also offers optional CNC accessories such as Automatic Tool Height Measurement and Part Probing System that save time and bring new functionality to the machine tool. 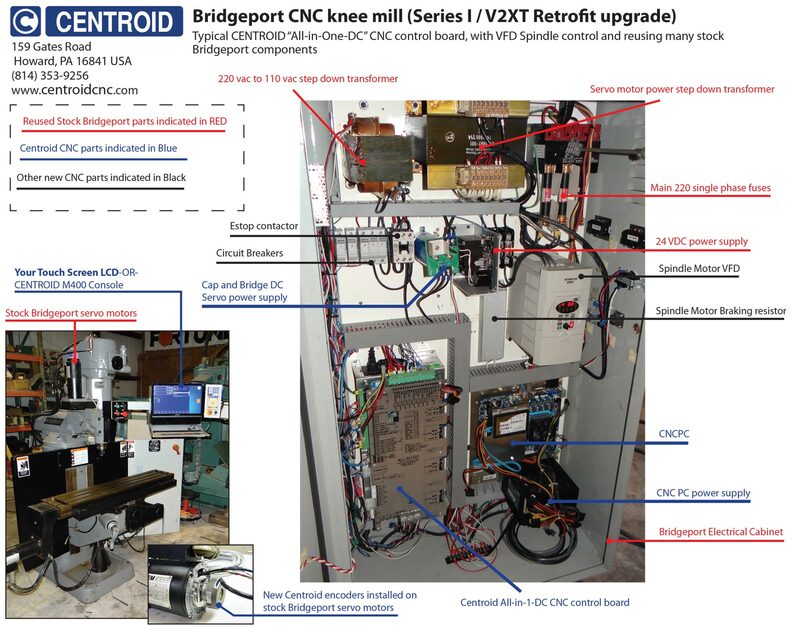 Bridgeport V2XT with DX-32 control CNC Retrofit Upgrade using many stock components and Centroid M39 CNC control upgrade kit. 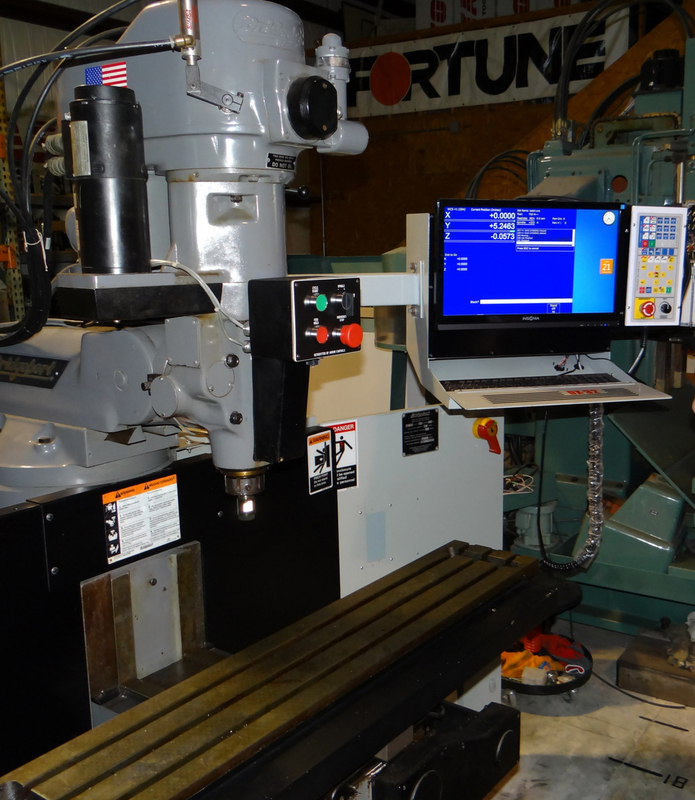 The M-39 is modern Windows 10 (Windows 7 or 8 is also compatible) CNC controller which brings this machine back to life with easy programming and operation. In the case of the DC servo motor based Boss 8 -12 machines and the V2XT (and any other servo based CNC) savings are gain by reusing the stock servo motors and fitting them with a modern encoder. This saves time and money during the CNC upgrade. The original Bridgeport electrical cabinet was also reused along with the stock operators console which was adapted to the new Centroid operators pendant and new LCD display. New Centroid All-in-One-DC CNC control board, CNC PC and power supplies were installed, while reusing the stock transformers for DC servo power, the cabinet disconnect and fuses. A spindle motor inverter (VFD) was added for programmable spindle control. This retrofit upgrade was performed by Terry Ruppe, Arrow Controls, Houston, TX. , click on this link to see the V2XT photo album. For these controls, you can reuse your existing servomotors and save money. Use the existing encoders (must accept differential Quadrature signals) or simply replace the low-resolution encoders with our 10,000 line units and dramatically increase the performance, and accuracy of your machine. See slide show below. These Bridgeport's were originally equipped with servo motors which (if in good shape) can be reused at significant savings. Professional Installation also available World Wide click here for a list of Centroid Factory authorized installers.